← Economies of Scale Article and VALUE VAULT Update. HP paid about $13 billion in 2008 and now announces a 62 percent write-off of its “growth capex” with this $8 billion dollar write-down of acquired Electronic Data Systems (EDS) Goodwill. Are there any lessons here? 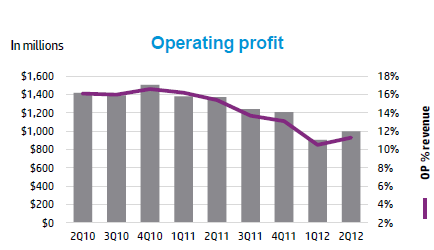 Note the graph of EDS operating profit below. As previously disclosed in its Consolidated Financial Statements for the fiscal year ended October 31, 2008, on August 26, 2008, HP completed its acquisition of EDS. The purchase price for EDS was $13.0 billion, comprised of $12.7 billion cash paid for outstanding common stock, $328 million for the estimated fair value of stock options and restricted stock units assumed, and $36 million for direct transaction costs. Of the total purchase price, a preliminary estimate of $10.5 billion has been allocated to goodwill, $4.5 billion has been allocated to amortizable intangible assets acquired and $2.0 billion has been allocated to net tangible liabilities assumed in connection with the acquisition. HP also expensed $30 million for IPR&D charges. HP did not pay a low price as you can see from the EDS financial statements above. Acquisitions of different businesses are fraught with peril: integration issues, CEO hubris, size over profits, and buying during the peak of the market (mid-to-late 2007). I post this as a reminder to return and look more deeply into any lessons I can take away from this transaction. Time, alas, is too short these days to stop and dig in. Hewlett-Packard Co.’s (HPQ) $13.9 billion purchase of IT outsourcer Electronic Data Systems Corp. (EDS) will likely shake up the sluggish high-tech M&A climate on many fronts, establishing HP as a successful acquirer of multibillion dollar businesses that could eventually pursue other large targets, while potentially spurring rival IBM Corp. (IBM) to explore purchases to solidify its shrinking lead in IT services. As the largest high-tech acquisition so far this year, HP’s $25-per-share purchase of Plano, Texas-based EDS may also wake up other high-tech companies to the compelling values to be had now that stock prices are low, analysts said. “In a recessionary climate, the reality is that many of these properties are pretty cheap,” said Rob Enderle, principal analyst at Enderle Group in San Jose, Calif. Enderle said larger acquisitions that emphasize acquiring people become particularly attractive in a weak economy, because a soft job market makes it more likely the target’s employees would stay, minimizing one key integration challenge. HP’s $25 per share purchase price represents a 32.9% premium EDS’ share price on May 9, but it is still considerably cheaper than EDS’ market capitalization over much of the past year, and significantly below EDS’ 52-week high of $29.13 per share. Coming on the heels of Microsoft Corp.’s (MSFT) abandoned $47.5 billion bid for Yahoo! Inc. (YHOO), this message about the values in the high-tech sector resonates. Although Hewlett-Packard’s acquisition of EDS was expected, the premium that HP paid was unexpected, and potentially unwarranted, given EDS’s recent track-record and a depressed outsourcing market. This sentiment was reflected in the market’s reaction, which wiped £8bn off HP’s capitalisation – more the than £7bn HP paid for EDS. Not an auspicious start. One major concern now has to be that HP has enjoyed great growth through non-exclusive partnering with rivals worldwide to secure business. Such partnering will now essentially come to a halt or be severely constrained. This comes on top of the huge and immediate task of integrating two very different business cultures. HP’s young and energetic “cut and thrust” team is now under the control of EDS chairman, president and chief executive officer, Ronald A. Rittenmeyer. This does not bode well for transferring staff, as EDS is far more formal, structured business. HP’s “cheque-book funding” will allow EDS to tender for more US and UK government work where balance sheet considerations play an important part in the larger deal constructs. However, EDS’s margins are far lower than HP’s – group CEO, Mark Hurd, will demand better ratios in line with investment community demands and that HP has, up to now, a record of achieving. Neither HP nor EDS has a serious business consultancy arm, and EDS squandered the talents of AT Kearney before selling it several years ago. The new company offers “customers the broadest, most competitive portfolio of products and services in the industry,” says Mark Hurd. Perhaps he forgets that clients favour multi-sourcing precisely to gain specialist skills and, importantly, innovation. Being the number two outsourcer by revenue globally will not help sustain this position if serious business consultancy is lacking. Is there another plan afoot to mitigate this structural and strategic short-fall? Given the decision delays in securing the EDS deal, I suspect not. Infrastructure consolidation, virtualisation and greening is a big boys’ “scale is everything” game and one for those with deep pockets too. The new HP can win huge revenues in this end of the market, however it will be at the expense of profitability. It was therefore hugely significant to note that no mention has been made of “deal synergies”. With a combined total of 210,000 staff, one would have expected 20% to be saved almost immediately. Integration of technologies would normally be expected too. This usually results in 10% in immediate savings, which could increase to 15% over time. Increased buying power would add 2% to 8% depending on the product or service being bought. None of this has been mentioned. All of these savings should run to hundreds of millions of pounds. You only get one chance to impress clients, analysts, intermediaries and, most importantly, the market-makers and institutional investors. The time to have captured the market’s mood and imagination was at the announcement, it has now passed Hurd by. Only results will count now. This deal is likely to be the catalyst for additional outsourcing consolidation with Atos Origin, CapGemini and even CSC. Will the cash-rich Indian offshored services providers finally make a move? These are truly perplexing times for new and existing clients of outsourcing. This entry was posted in Risk Management, Search Strategies, Valuation Techniques and tagged Acquisitions, Case Study, EDS, HP. Bookmark the permalink. EDS has $3b in cash and $3b in debt. It has $10.6 in half year 2008 revenue and as you say around $5.6b in operating income in the next 4 quarters (from the graph). I don’t see $13b as an expensive price to pay for EDS. In fact, I will posit that the price paid has been on the cheaper side. Granted that EDS might have been in a different business and the acquisition did not make sense strategically, but the point about EDS being expensive is invalid. Why do you believe the price paid was cheap? I don’t really know by the qualitative aspect whether the price paid was cheap or dear. Experience tells me that “People” acquisitions are extremely tricky to integrate–the risks of failure are high. I said “cheaper side” because I have seen HP and Cisco waste a lot more money on acquisitions. Look at Autonomy for example. At least EDS had no net debt and $22 b in revenue. The P/S ratio paid was around 0.6 which I do not see as overly expensive. EDS was in IT service industry and a P/S of 0.6 is cheap for this industry. I understand that a comparison like this does not make a lot of sense and I do not have the FCF data. With a $8b write down obviously the deal did not work out as planned but this could not have been seen beforehand. This might be a good argument against expensive acquisitions. As you say they are tricky and I agree with you.